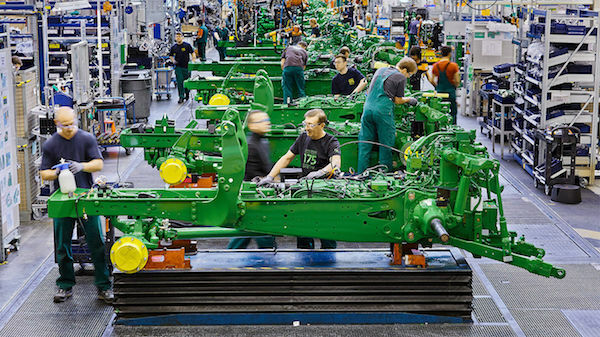 The past century has seen generations of John Deere factory employees taking a tremendous amount of pride in the work that they do every day. It’s core values such as innovation, quality, integrity, and commitment that have reminded workers like Ryan Howard and Gaylord Converse of why they started working with John Deere equipment in the first place. Whether these values are embraced by one person over the course of a few decades or passed on from family member to family member, dedication to the John Deere brand and its equipment is what makes these employees worthy of recognition. Watch the videos below to hear stories of two John Deere factory employees and their commitment to their work. Ryan Howard, a supervisor of operations at Waterloo, is a 2nd generation employee at John Deere. Not only have Ryan’s parents worked for the company for 40 years, but his brother and sister-in-law are John Deere factory employees, as well. In addition to these family members that work with equipment on an assembly level, Ryan has family members outside of the company who use the machines that he works to put together on a daily basis. With an understanding of how the quality of effort he puts in affects people every day, Ryan works to ensure that not only will his family tradition of working with John Deere equipment carry on, but also that the core values of John Deere will continue to live on, as well. Since January 23, 1967, Gaylord Converse has played a role in the assembly of almost every model of tractor that John Deere has built. As a John Deere factory employee, Gaylord has put forward a quality of work that has benefitted customers over the past 50 years. This enthusiasm towards John Deere equipment carries over to Gaylord’s personal life, as well, with his wife joking that when he is not working at John Deere, he is working on a John Deere. Gaylord’s sense of hard work and dedication to John Deere inspires those around him, from his co-workers to his son and grandson, both of whom help out on the farm. Past decades have seen John Deere factory employees like Gaylord putting in the quality of work that has been showcased in the durability and reliability of every piece of machinery that is created. It’s reasons like this that the legend of John Deere will continue to run on. We hoped you enjoyed learning about the quality and core values that go behind each piece of John Deere equipment!